Wandering around, I became increasingly conscious of a unique vibe in the city; the architecture and neatly-planned streets are distinctly Austrian but as I observed the people, I couldn’t help but notice a certain ‘joie de vivre’, something I found very appealing. I felt it everywhere: from the alfresco cafés, bustling markets and hip coffee shops to local designer stores and deli’s. The distinct laid-back feel and youthful vibrancy combined with an almost tangible love for fresh produce, artisan products and cool designs was pretty remarkable. Start your stroll at the Hauptplatz and explore the streets and alleys around Herrengasse and Schmiedgasse. From the Hauptplatz, stroll along the Sporgasse and the Hofgasse streets towards the Dom (Cathedral), Burgring and the Stadtpark (City Park). Then slowly make your way down to the Oper (Opera House) and further to the Joanneumsviertel (a square surrounded by the Art and Natural History museums and the Styrian Library). From here, cross the Mur River to explore the hipster neighbourhoods such as the Annen Quarter and the Mariahilferstrasse. Drop by at the lively Farmers Market at Lendplatz (in the mornings from Monday to Saturday) and have a coffee/drink/snack at one of the cool cafés such as Die Süsse Luise. Another farmers market which is worth a visit is at Kaiser Josef Platz, behind the Opera House. You can also opt to go on a cool 2.5 hour Polaroid photo walking tour of Graz. Chilling at Susse Luise at the Farmers Market on Lendplatz. The Schlossberg (Castle Hill) towers above the cityscape and is home to Graz’s famous icon, the Uhrturm or Clock Tower. You can take an elevator or the stairs from Schlossbergplatz, or the funicular railway. Once you’re up there, you’ll have a stunning panoramic view of the city, and you can also visit the castle. A panoramic view of Graz from Schlossberg. Here’s a challenge for you: look at the Clock Tower and try to figure out the time! Hehe! While you’re here, drop by at Schlossberg Biergarten (Beer Garden) or Aiola Upstairs café/restaurant for a drink/meal and fabulous views. Speisesaal (located in Hotel Wiesler, this gorgeous restaurant serves contemporary cuisine with a Middle Eastern touch). Der Steirer (this popular deli/restaurant serves typical Styrian fare – don’t miss the bäckhendl or fried chicken!). PARKS Art (A cool organic vegan café/restaurant situated directly behind Hotel Wiesler). Guttmann (stall no. 3 at Hauptplatz. An excellent place to try a variety of sausages). Frankowitsch (a popular café/restaurant that serves terrific Austrian-style pintxos/tapas). Eis-Greissler (this cute ice-cream shop in the Sporgasse serves arguably the best ice-cream in Graz!). Hofbäckerei Edegger-Tax (this bakery in the Hofgasse can trace its history back to 1569 and was the official baker of the House of the Habsburgs. Behind its exquisite façade is a mouthwatering collection of breads, cookies and cakes). Gasthaus Stainzerbauer (the oldest restaurant in Graz serves gorgeous local specialties in cosy surroundings. Ask if you can visit the wine cellar!). Aiola Upstairs (located atop Schlossberg, this restaurant with an outdoor terrace boasts beautiful views of Graz and a varied contemporary menu). Sterz im Mohrenwirt (located in the Mariahilferstrasse, this traditional restaurant serves terrific Austrian food and wines). Local fare at Sterz im Mohrenwirt. s’Auenbrugger (this lovely wine bar across the street from the Kunsthaus has a fabulous collection of local wines). Bar Albert (a popular bar in Graz, Albert is there himself to introduce guests to his favourite local gins. Try some of the local delicacies to accompany your cocktail!). Graz is a dream for shoppers who love vintage and designer goods. The main shopping areas can be found in the city centre around Hauptplatz and Herrengasse. If you’re interested in local products (from liquors to jams) or an authentic souvenir, visit ‘s Fachl, located in an alley off Herrengasse. In this shop, local producers hire a box to showcase their products! Local products at ‘s Fachl. 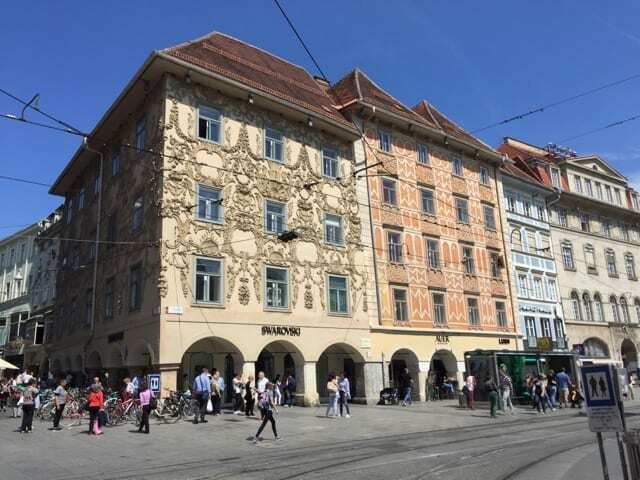 Graz is also famous for its design shops which sell a big variety of fashion accessories, clothing, bags, shoes, interior decoration and furniture. Check out Tag.werk and Kwirl in the Mariahilferstrasse, and Heidenspass in the Griessgasse. Look out for the ‘heart-on-a-hand’ sign which signify a Charity Design Shop. These shops sell upcycled bags, recycled fashion and home decorations from youth employment projects. And if you’re looking to get your hair done, visit this vintage hairdresser in the Mariahilferstrasse. The interior is really cool! Locals call it the ‘friendly alien’. I’m not sure what to call it. Haha! In any case, a visit to the quirky Kunsthaus Graz (Art House), with its funky exhibitions, is a must. When you’re done, head to the laid-back Kunsthaus Café for a drink and a bite. The Kunsthaus, with its characteristic blue skin, is also a treat to see at night when it dazzles passers-by with a light show. I’m a big fan of spiral staircases, and taking photos of them. The 15th century double-spiral staircase (located inside the Burg, the offices of the regional government) is one of the most unique specimens I’ve ever seen! Locals call it the ‘stairs of reconciliation’ because if you choose to go in opposite directions, you’ll meet each other again on the next level. This staircase was definitely one of my highlights in Graz! The Double spiral staircase viewed from the top. Another view of this unique staircase. After all that exploring, take a break in the leafy Stadtpark (and look out for Hansi, the city’s famous squirrels) or go for a leisurely stroll along the banks of the Mur River. The Mur River with the famous clocktower in the background. In the spring/summer months, both places are full of locals out for a jog or a walk, or sipping on a cold beer/cocktail. If you choose a stroll along the river, visit the Murinsel, a futuristic building built on an island in the river. This building houses a café and art exhibitions. You might even spot someone surfing in the Mur River! The coffee scene in Graz is another element which makes this city so cool! Some of the coffee shops I visited include Tribeka (next to Hotel Wiesler), Grand Café Kaiserfeld (with a special corner dedicated to the city’s most famous citizen: Arnold Schwarzenegger!) 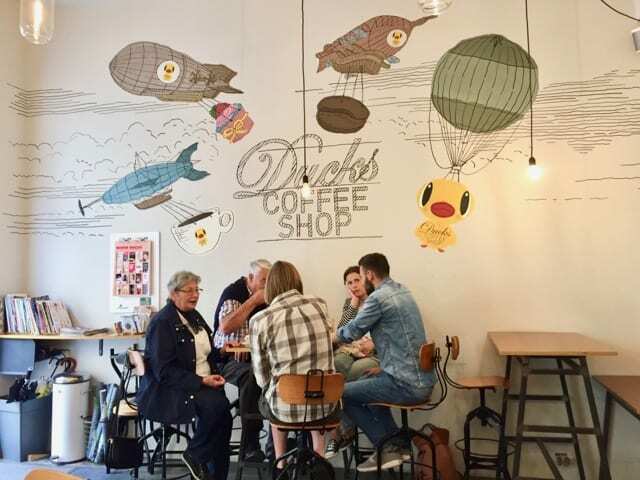 and the Ducks Coffee Shop (yes, with a vivid duck theme)! Located a 15-minute tram ride away from the city centre (take line 1 from Hauptplatz), Schloss Eggenberg (or Eggenberg Palace) is one of Austria’s historic gems and the most important baroque palace in Styria. In 2010, Schloss Eggenberg was added to the UNESCO World Cultural Heritage list. The grand Planetary Room at Schloss Eggenberg. 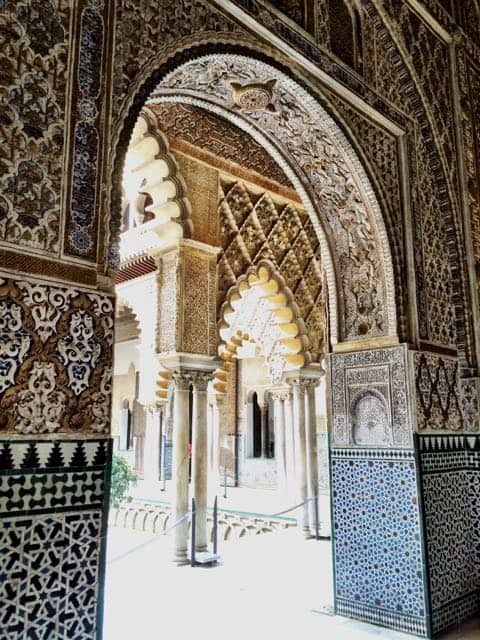 The most intriguing aspect about this palace is the role of astronomy in its design. The Planetary Room is the palace’s grandest whilst Japanese visitors will be fascinated by the ancient scenes of Osaka in one of the smaller rooms (apparently the only visual representation of Osaka before the great siege that destroyed the old city in 1615. While you’re there, stroll around the resplendent palace gardens and look for the peacocks! Read about my visit to Schloss Eggenberg. The countryside around Graz is home to one of the leading wine-producing areas in the country. 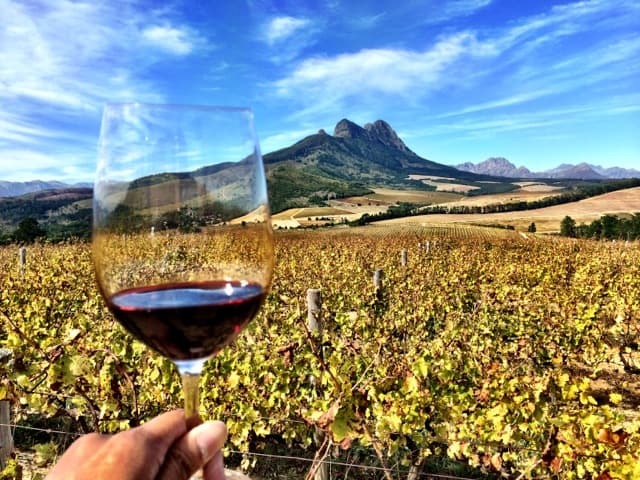 Less than an hour’s drive outside Graz, you’ll find the South Styrian Wine Road, a touristic wine route that curls its way around the gorgeous hilly winelands. Expect green rolling hills, mile after mile of vineyards, picturesque villages, wine taverns and lovely, family-owned hotels and inns. This wine route makes for a great day-trip from Graz or you can even stay a few days longer to explore the region. There it is… my recommended things to do in Graz! This list is by no means exhaustive and you’ll soon discover many more delights in this cool city. I stayed at the Hotel Wiesler, situated alongside the Mur River, and just steps away from the Kunsthaus and several minutes from Hauptplatz. The lobby features an intriguing art piece hanging from the ceiling and the Speisesaal restaurant next door (where breakfast is served) is absolutely gorgeous! The lobby at Hotel Wiesler. My room looked fairly spartan when I entered but I quickly noticed the various handy amenities, including a pair of binoculars to enjoy the view. It certainly was spacious, had a very comfortable bed and offered a beautiful view of the river and the historic centre of Graz. My room at Hotel Wiesler. Check rates at Hotel Wiesler. The free Graz City Map. 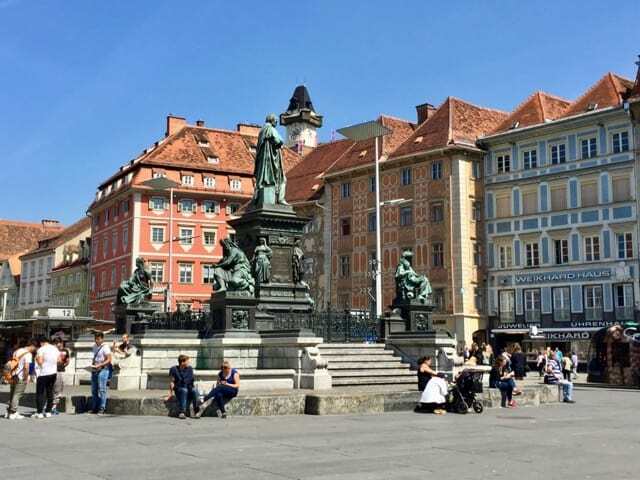 For more information on what to do in Graz, visit the website of Graz Tourism. Should you choose to visit Graz (and I recommend you do), drop by the Graz Tourism office in Herrengasse 16 and pick up your free copy of arguably one of the coolest city maps I’ve ever seen! Note: my trip to Graz was part of the #EuroCityTrip campaign organised by iambassador with Graz Tourism. As always, all views mentioned above are mine, and mine only. Hehe, glad I could do your hometown some justice. 🙂 You live in such a lovely city! Lovely tour of Graz, names all the reasons I decided to make it my home! I think the one store is called S’Fachl though, since it’s a ‘Fach’ that they are renting. Just by looking at the pictures I feel the vibe you’re talking about, Keith! Graz really has that unique charm to it. Don’t you just love it when you “discover” an amazing city before it gets too popular in the entire travelling world? It’s like keeping everything to yourself for a while, where everything’s a bit more personal. 🙂 But it would be a shame if it doesn’t get the attention it deserves, right? Looks like it could be the next great Austrian destination! Great list of things shared to do in Graz. Stunning Pictures. Thank – You. Lovely! post Keith. Graz is beautiful, very helpful post. Thanks for sharing.